Kerry Pinette (inset) offered the CDV on eBay. Says he's not the picker. 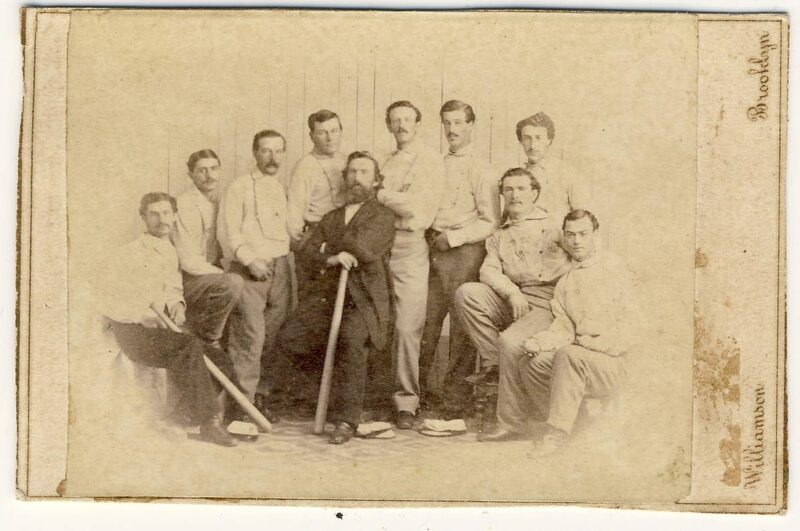 A Maine auction house predicts that a rare CDV photograph of the 1865 Brooklyn Atlantics will fetch over $100,000 when its offered for sale in February. The CDV was allegedly found at a yard sale in a moldy photo album in a cardboard box or a trunk in a woodshed or a garage by an anonymous picker who put it on eBay through another guy, then sold it to another picker who sent it to a big auction house that allegedly said it was fake. 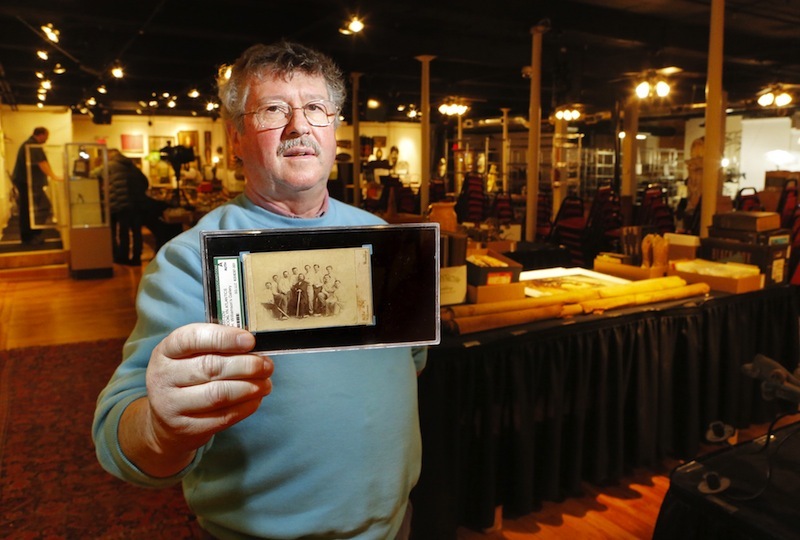 That guy then got a refund and returned the card to the original picker who sent it as a consignment to Saco River Auctions in Biddeford, Maine. Collectors questioned the auctioneer whether the photo affixed to the card was real, so he took it to an expert in Boston who says it likely is. The Boston Globe erroneously called it the “first baseball card” and the auctioneer says it’s the rarest of rare cards with only one other known to exist at the Library of Congress. Follow all that? The CDV-find by the anonymous antique picker could be one of the greatest discoveries ever made in the state of Maine since Saco River Auction’s manager and ex-cop, Troy Thibodeau, was in the news when another rare card was discovered– George W. Bush’s DUI arrest record, found in Kennebunkport before the 2000 election. On New Years Day, Saco River struck again when they sold yet another extremely rare 19th-century cabinet card of baseball player Charlie Ferguson shot by Gray Studios in Boston as a proof for the Old Judge cabinet issue by Goodwin & Co. The Ferguson card was first sold on eBay in 2011 and afterwards collected by the FBI under suspicion of being stolen from the New York Public Library’s famous A.G. Spalding Collection. Saco River Auctions just sold this SGC-graded Gray Studio cabinet card of Charlie Ferguson on New Years Day. The card was in the FBIs possession, suspected to have been stolen from the NYPL. The NYPL is missing at least two Philadelphia player cabinets by Gray. Outside of the 43 they still have, none were known to exist outside the NYPL until the Saco River offering surfaced. 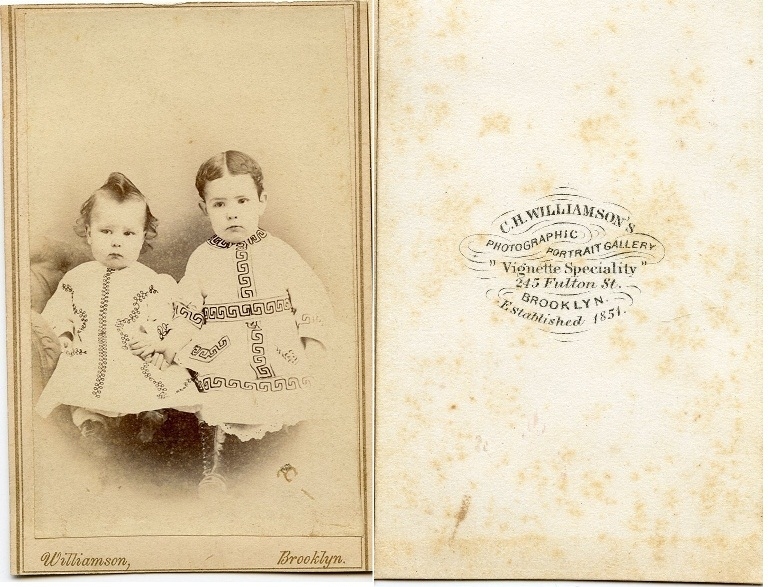 This is how the 1865 Brooklyn Atlantics CDV appeared when Kerry Pinette offered it for sale on eBay in June of 2012. The card appears to include an albumen image that may not have been original to its Williamson mount. As indicated in “Part One” of this series, none of those reports revealed that the Atlantic CDV is suspected to have originated from the NYPLs Spalding Collection, which at one time included a Williamson photograph of the same Atlantic team with the players listed in the exact same positions, left to right. That rare card appears on the NYPL’s inventory published in the 1922 guide to the Spalding Collection. In addition, sources indicate that the card’s title is currently being investigated by the New York office of the Federal Bureau of Investigation as part of its nearly four-year probe into the thefts from the NYPLs Spalding Collection, which commenced at the same time an article was published in the New York Times in July of 2009. This excerpt from NYPL's "Spalding Missing List" describes the two Williamson photos once housed at the library. 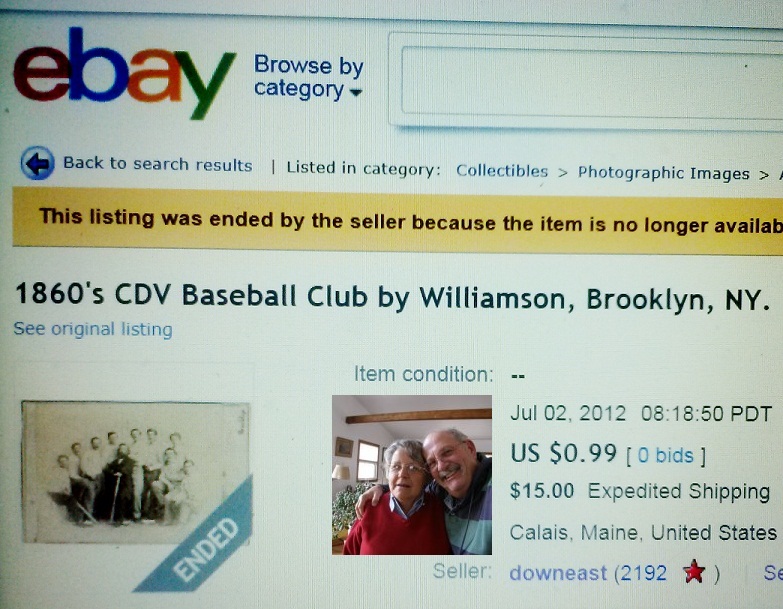 The eBay seller who originally offered the CDV for sale last summer on eBay was Kerry Pinette, of Calais, Maine, a neighboring town eleven miles from Baileyville, where the rare card was allegedly discovered at a yard sale. Pinette uses the name DownEast as his eBay seller handle and has most recently offered old coins and one 19th century stereoview. Haulsofshame.com contacted Pinette at his home and confirmed that he was the eBay seller of the card but he denied that he has ever owned the card or had any financial interest in it. Said Pinette, “I just listed it for the guy who found it and I don’t know anything about a partner or somebody buying it.” Pinette would not divulge who gave him the card to list on eBay and directed Haulsofshame.com to contact Saco River Auctions for any other inquiries. However, if Troy Thibodeau’s story on behalf of the auction house is true, it was Kerry Pinette who discovered the card, ran it on eBay, sold it to his friend, (who sent it to Lelands) then got the card back from his partner, refunded his partner’s money (when Lelands returned the card) and submitted it to Saco River Auctions, not mentioning Lelands had already returned it as a “so-called fake.” Pinette’s denials beg the questions; Who is telling the truth, and why would anyone fabricate or lie about these details? Why the great mystery over who the alleged lucky picker is? These two CDVs of Andrew Peck and Harry Wright were stolen from NYPL and recovered by the FBI. Each shows the defaced and altered NYPL stamp . (An unaltered stamp appears at the lower left). The FBI has kept a close eye on the offerings of rare 19th century images, especially CDVs. The FBIs heightened scrutiny is a direct product of its recoveries of other rare CDV photographs that were also listed as missing from the NYPLs Spalding Collection . 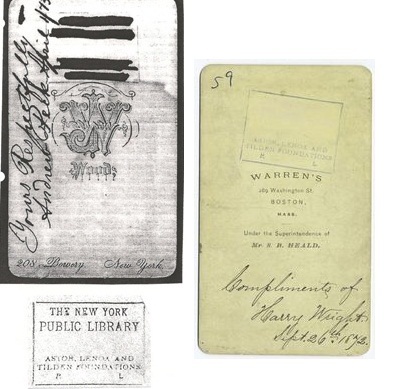 The tell-tale sign on those stolen CDVs were the NYPL ownership stamps which had been obscured, altered and defaced to conceal the NYPL Spalding Collection provenance. Enough press has been generated by the current FBI investigation into the NYPL thefts that anyone in possession of one of the hundred or so rare photos still missing from the library would know that they could never sell such an item at auction without it being confiscated. This c1860s Williamson CDV and mount was sold in January on eBay for $5.99. The only other way to sell or dispose of such an item would be to switch the original NYPL mount, (with evidence of the theft on its reverse), to a clean period mount attributed to the same photographer. CDV’s from the Williamson Studios are regularly offered for sale on eBay and through numerous other outlets. A similar Williamson mount sold on eBay this month for $5.99. 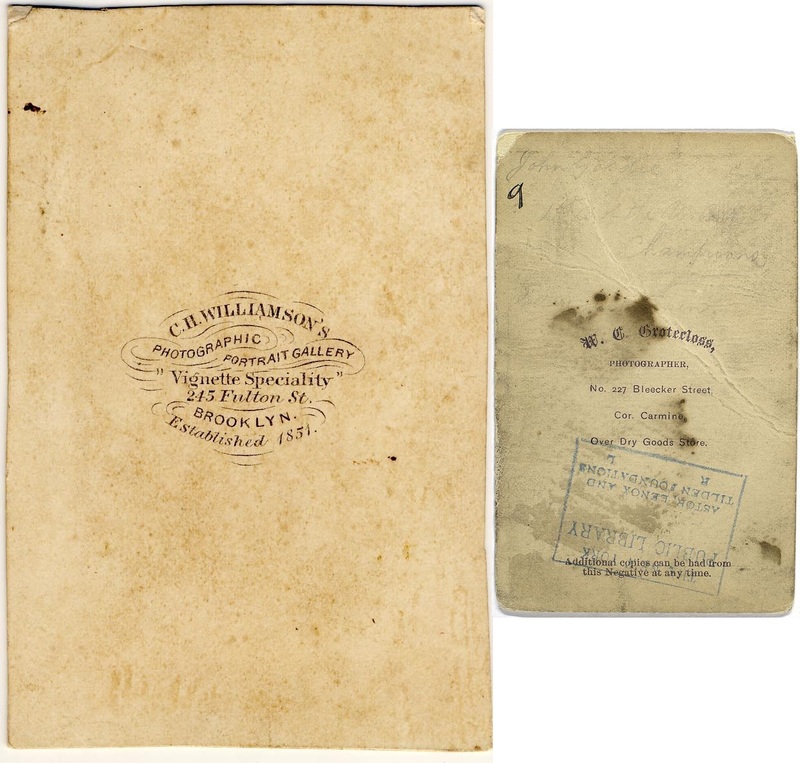 The back of the Atlantic CDV (left) appears clean and devoid of any NYPL ownership marks, unlike the reverse of a CDV of player John Goldie in the NYPL collection (right). One CDV recovered by NYPL featured sporting-goods king Andrew Peck and was found in 2006 in the home of collector Barry Halper, by his widow, along with other items stolen from the Boston Public Library. Another recovered CDV pictured Harry Wright and was offered on eBay in 2000 and identified by the library as NYPL property. 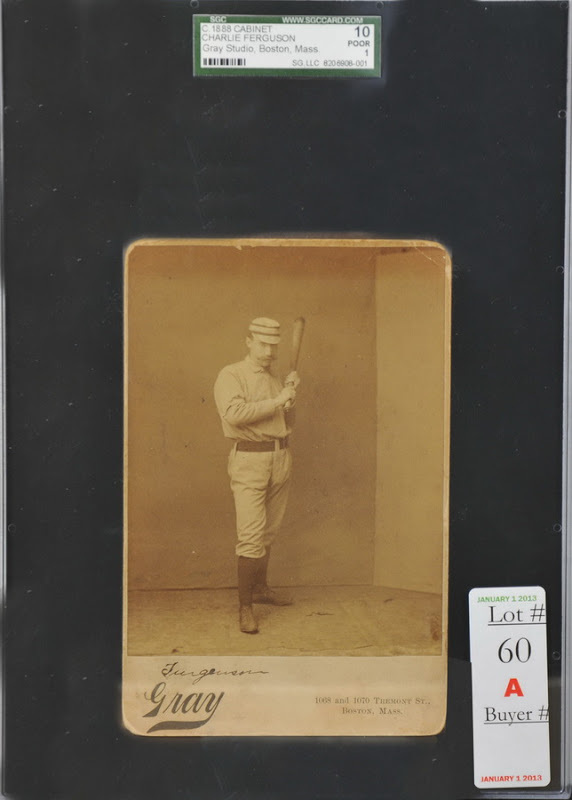 The Gray Studios cabinet photo of Philadelphia player Charlie Ferguson that was sold by Saco River Auctions on January 1st also appeared on ebay in 2011 and was identified as another item possibly stolen from the NYPL collection. After it sold for over $900, the FBI took possession of that photo to further investigate claims that the card was stolen from the library which houses the largest single assortment of Gray Studios cabinets of the Philadelphia NL team managed by Harry Wright. Those photos were originally part of Wright’s personal archive. That cabinet photo was sold on eBay by Henry Withers under the name HankDog1939 and was returned to the buyer by the FBI after they held onto and examined the card for close to a year. 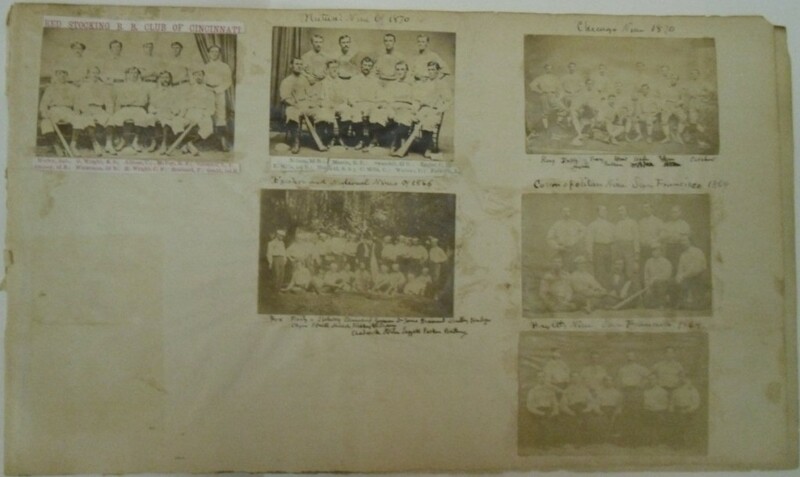 This page from NYPLs Chadwick score books features raw cdv-sized albumen photographs of 1860s teams pasted onto a score book page. (NYPL, Spalding Collection). The FBI has also seen evidence that shows how original albumen photographs, letters, documents, season passes and other ephemera have been wrongfully removed from Spalding Collection scrapbooks and score books with sharp objects and razors. It is believed that other original albumen photos may also have been removed from the NYPL manuscript holdings and reattached to period mounts. In just one score book once owned by Henry Chadwick, there are over ten rare albumen CDV-sized photographs of the Excelsior, Washington National, Mutual, Red Stocking and Chicago teams along with an ultra-rare photo of Jim Creighton. Last week a source told Haulsofshame.com that Lelands’ concerns regarding authenticity were “based on irregularities, not of it being made by use of a copy machine.” It appears that auctioneer Troy Thibodeau approached 19th century photo conservator Paul Messier with his primary goal being to prove that the photograph was an albumen print and not created with a laser printer. That “laser-copy” claim may not have been made by Lelands. Lelands declined comment at this time. Thus, Saco River’s selective report only deals with that singular issue and not the issues relating to whether the photo was original to the mount or whether the binder or glue was authentic for the period. The report does not rule out the possibility that the image was re-affixed to a clean mount to conceal its possible NYPL provenance. The CDV being sold by Saco River Auctions appears to have had a prior image affixed to it as evidenced by the remnants of binding material visible above the "Williamson" name. Supporting these concerns, is the evidence that suggests the CDV being offered for sale may have had a prior photograph attached to the mount. The tell-tale evidence suggesting this is visible to the human eye at the far right side just above the “Williamson” graphics. Remnants of adhesive material appear to extend in a straight line along the right side border. The residue is most visibly defined on the left hand corner. 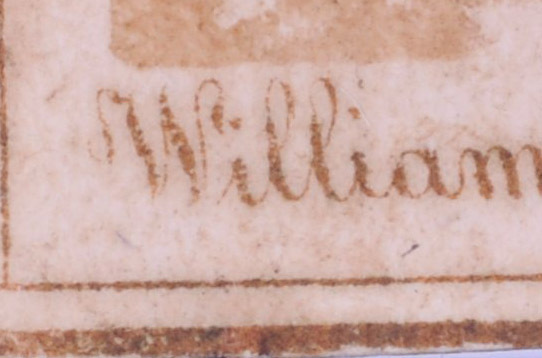 The Williamson CDV mount shows evidence of another image having been affixed to the card. Miller has also noted that if it was created in 1865, the CDV would likely have a US revenue stamp on its reverse, or evidence that such a stamp was affixed to the back at one time. Miller says, “Between August, 1864 and August, 1866 photographs were taxed, requiring a revenue stamp to be attached and cancelled on the back of the photograph.” The current Atlantic CDV does not appear to have had one. We contacted Troy Thibodeau to ask if he’d been contacted by the FBI and whether Kerry Pinette was in any way involved in the current sale of the card. When asked if he would answer some questions Thibodeau replied, “No need to,” and refused to entertain our inquiry. The NYPLs Spalding Collection features several card issues included in the "Standard Catalog of Baseball Cards." Several of those issues are almost exclusive to the library's collection, including the Gray Studio cabinets. Margolin also said he could not comment on why the FBI sent the Gray Studios cabinet photo back to its owner to sell at Saco River after it was in the Bureau’s possession for nearly a year. 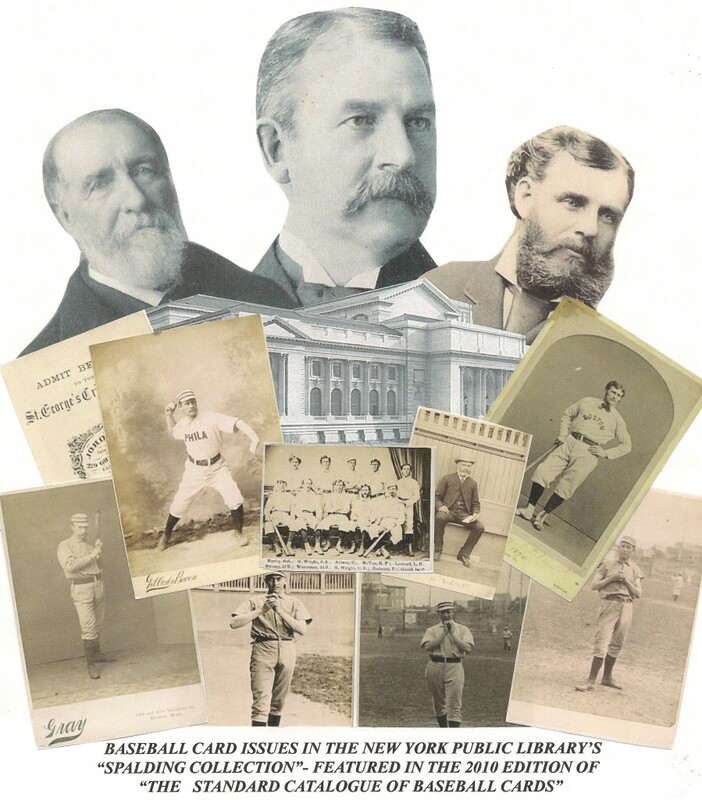 Sources indicate that it was returned because the card did not show evidence of an NYPL ownership stamp, however, not all Spalding Collection items were stamped. The decision to send the card back was made by the US Attorney’s office and not the FBI. Sources also indicate that despite the card’s return, neither the NYPL, FBI or US Attorney have made any admission that the Gray Studio cabinet was not NYPL property. The FBIs Spalding Collection investigation has dragged on for close to four years, however, several significant recoveries have been made during the course of the probe. Heritage Auctions recently withdrew Ezra Sutton’s 1879 Boston Baseball contract and Henry Chadwick’s 1894 NY Giant season pass; Legendary Auctions withdrew a rare Peck & Snyder trade card of the Cincinnati Red Stockings that was once in the collection of a reclusive collector named Abe Samuels; and the FBI has taken possession of over fifty documents originating from the Harry Wright correspondence at the NYPL as well as cabinet card photos of Harry Wright and Kid Gleason. In the FBIs defense, the recovery of baseball relics is hardly a high priority when compared with other investigations involving murders, gangs and organized crime and the time devoted to the NYPL situation is hamstrung by those constraints. The same New York office of the FBI looking into the Atlantic CDV and the NYPL thefts just broke up an organized crime ring of 32 mobsters, including Genovese family associate, Carmine “Papa Smurf” Franco, as part of a multi-year investigation into organized crime’s control of the garbage-hauling industry in New York City and New Jersey. Stay tuned for part three in this series which will examine common links between these artifacts with suspected NYPL provenance…. LeBlanc also sells on eBay and recently put his Billy Nash Old Judge cabinet up for sale with a Buy-it-Now for $7,500. eBay shows that LeBlanc received 11 offers on the card and that the offering was “ended by the seller because the item is no longer available.” In his description LeBlanc said of the card, which is also under suspicion of being a missing item from the Boston Public Library, “I HAVE THE GREAT PLEASURE OF BRINGING THIS SCARCE CARD TO MARKET,” and “PLEASE KNOW THAT THIS CARD CAN BE PULLED AT ANY TIME. I DO HAVE A STORE AND MY ITEMS SELL QUICKLY.” LeBlanc told Haulsofshame.com that he plans on reselling the Atlantic CDV for a profit as well. ”Hopefully, I can double my investment on this card,” he said. LeBlanc indicated that his 4-year old son had some physical challenges and that the profit generated from a future sale of the Atlantic CDV could really help him. of two in existence since the Library of Congress has one in its collection. It turns out, though, that the two cards are similar but not quite the same. They were printed from different negatives. UPDATE Monday Feb. 11: NPR responded to a Haulsofshame.com inquiry about its report that Saco River auctioneer, Floyd Hartford, was the antique picker who discovered the 1865 Brooklyn Atlantic CDV at a Yard sale in Baileyville, ME. NPR editor, Tanya Ballard Brown, informed us this morning via Twitter saying: ” I realize now that I was wrong! I have added a correction the post. Sorry for any confusion” . Jes’m Crow. Before y’all get carried away, know this: Andy Dufresne ain’t had nothing to do with it. Y’uuuuuuuuuup. Is this an auction house or a serial killer???? How you doin’ Saco River Auction? The picker, who is not being identified by the auction house, found the card in a moldy old photo album while looking for antique furniture. He was not at Wednesday’s auction. Just gets curiouser and curiouser, said Alice. Colonel Mustard found it in the wood shed. Pete you need arrows and notes pointing to who did what!! My gosh it’s hard to follow…how do you keep it all straight! It reminds me of slight of hand..did I really see what I saw? Maybe that what they want to do…confuse and bewilder!